Performers at the Thai Culture and Food Festival 2017. Photo by Bret Redman. Pad Thai and masked dance-theater galore. This weekend, the Buddhist Center of Dallas will host two days of the Thai Culture and Food Festival amid azaleas, traditional dance and music troupes, and street food stands bristling with what I’ve many times singled out as the most authentic Thai food in town. The most sumptuous and festive of the Dallas Thai cultural events, this festival seems, every year, to have more street food stalls, serving Thai iced tea, skewers of satay chicken, fried taro, brothy soups bobbing with goodies, fragrant curries that hum with coconut and keffir lime, mango and sticky rice, and coconut ice cream thick with grated coconut meat. Meanwhile, on the culture side, there is always an array of Thai classical music performed by students, a multitude of dances (regional and traditional), Thai boxing and sword fighting, and a display of Thai costumes. And—unlike anything you’ve seen in their glittering, vibrant regalia—a troupe of masked Thai dance-theatrical performers will enact segments of the Ramayana while you sit around the koi pond, soaking it all in. This is the highest form of the Thai classical arts, and hard to find outside of Thailand. The two-day festival also features temple tours and a pop-up shops with handcrafted Thai gifts. The sense of pageantry is majestic, the aromas tantalizing, and the lightheartedness incredibly contagious. For a peek at last year’s festivities, check out this photo gallery. When: Saturday and Sunday (May 26 and May 27), 10 a.m. until 6 p.m.
10. Kate &Amy Thai desserts: Thai crispy crepe (ขนมเบี้อง ) and curry puff. 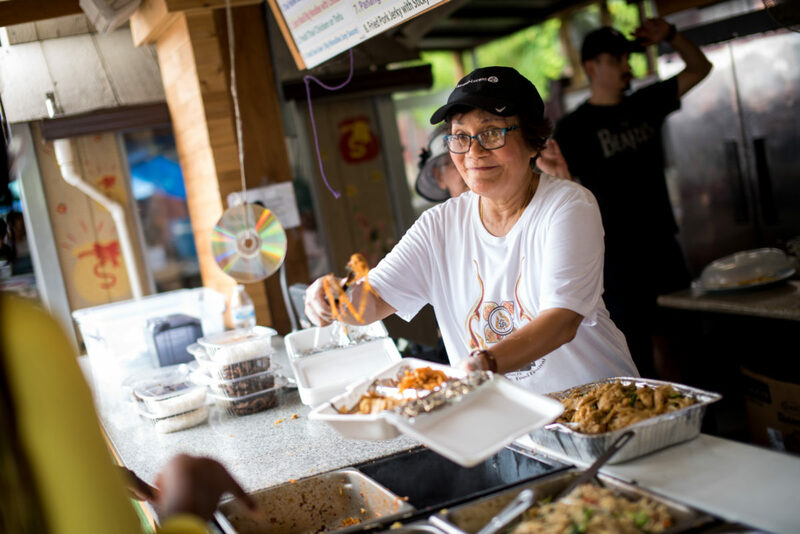 Food stands at the Thai Culture and Food Festival 2017. Photo by Bret Redman.